Above: George’s composite photo of Errwood Farm alongside an 1888 map. The blue areas are today’s twin reservoirs, and the green dashes show the old north-south route through the valley. My thanks to George for sending a composite image he’s created of Errwood Farm, super-imposing an old photo of the attractive farmhouse on the same spot in today’s landscape. Samuel Grimshawe is said to have stayed in the farmhouse to oversee the building of Errwood Hall in the late 1830s. His father, also called Samuel, had purchased the 2010 acre Errwood Estate from John Jodrell in 1832 for the grand sum of £9250. 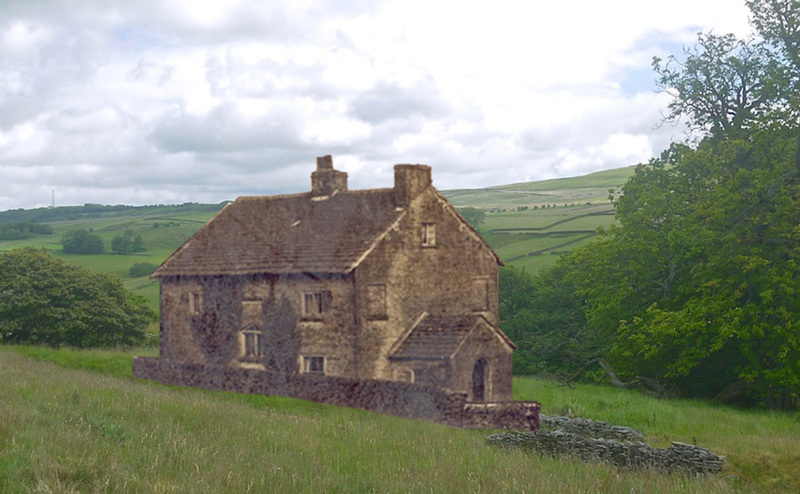 I’ve created this fade using George’s photos, and another below showing where the farmhouse once stood. Simply click the ‘Then’ and ‘Now’ buttons to fade between the two views, or drag the green slider. The farmhouse was demolished in the mid 1930s. Today, all that remains are a few scattered stones and some bumps and hollows in the ground. To find them, follow the signs from the main car park towards Fernilee Reservoir, but go left before you reach the small, wooden gate. The remains are just up the slope, overlooking the valley below. Above: Today’s main car park lies beside the old Roman road. It’s just visible on the satellite view at bottom left, close to the shore of Errwood Reservoir. Fernilee Reservoir lies to the north. Most of the farmhouses on the estate were demolished in the 1930s during the construction of Fernilee Reservoir. Click here to view more information about the farm, as well as census records of the families who once lived here. And click here to read about Sarah’s search for the house in which her grandparents once lived.